This is picture heavy, but stick with me. 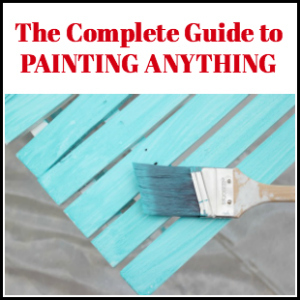 1 – 2 quarts of gloss exterior paint depending on how intense you want your colors. I used two quarts. 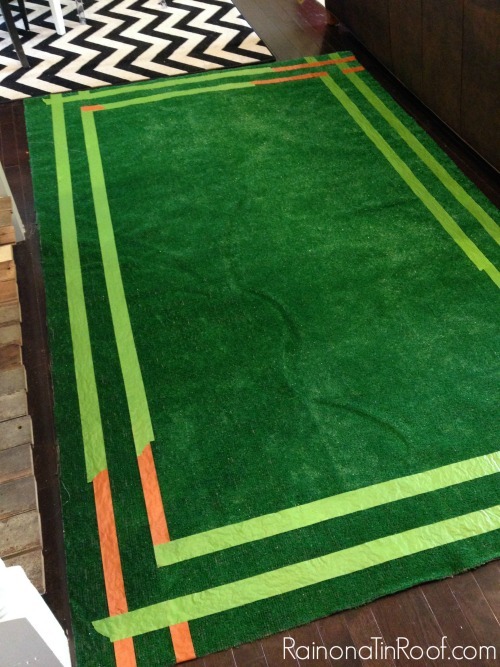 Roll out the rug and begin marking your border off with FrogTape. As you can see, I was super technical with measurements and used tape as my guide. 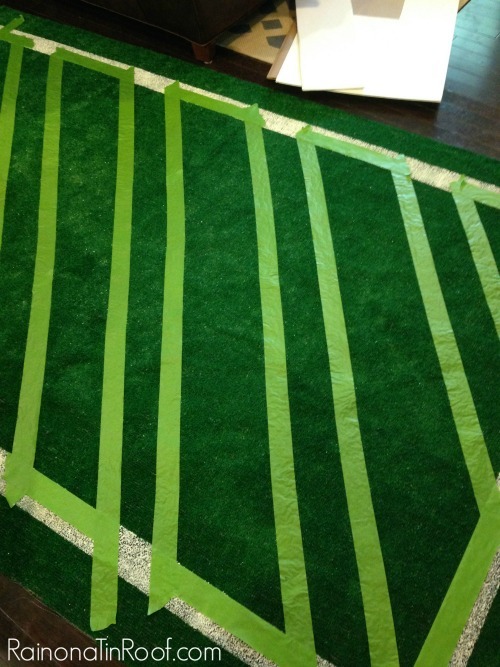 I started on the very edge of the rug and placed three small strips of tape that would remain AstroTurf underneath, then two strips that would be painted white, then another strip for Astroturf. 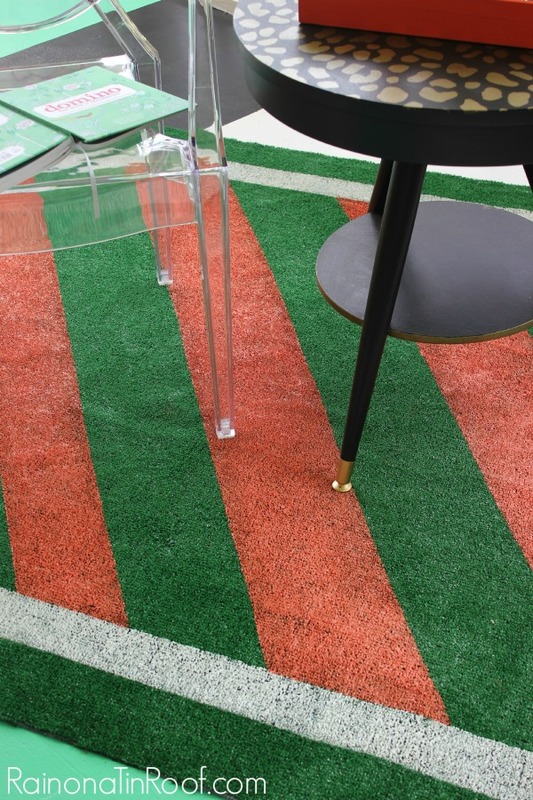 You want to paint inside of the tape marked Astroturf. See the photo above. Finish taping the rest of your border around the edges of the rug. You will have some overlap that needs to be cut out on the corners where the tapes meet. 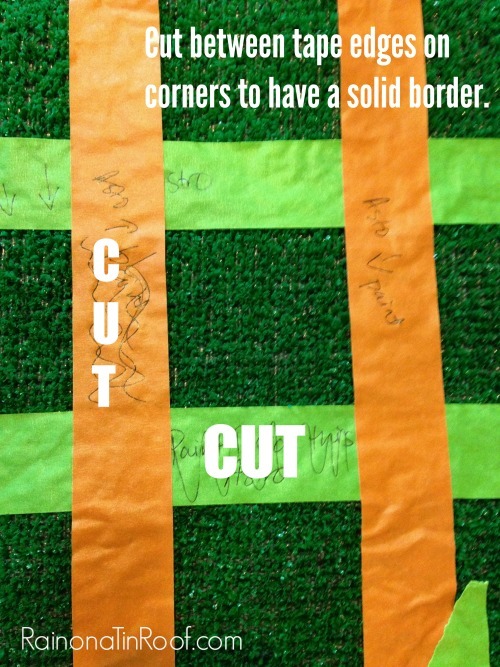 Cut out the small pieces of tape that would keep your border from being continuous as shown above. I found the best way to paint AstroTurf is with a roller. 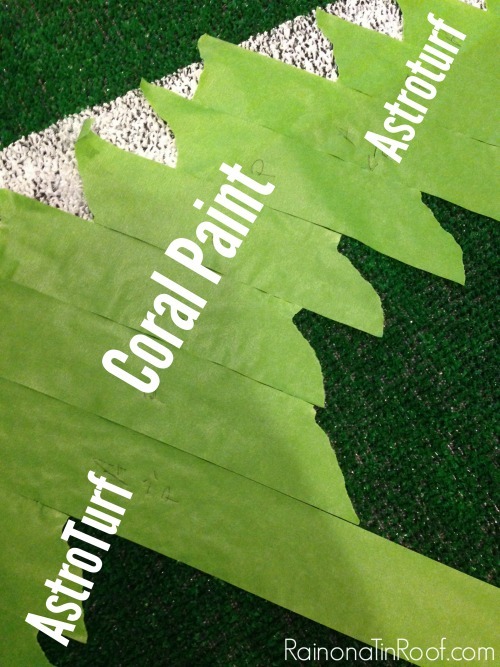 I did three coats and went in different directions with each coat to get every side of the AstroTurf fiber. Remove the tape around your border after your final coat. I didn’t wait for it to dry, however if you put the paint on pretty heavy, you may want to wait a bit to make sure you don’t get leakage. 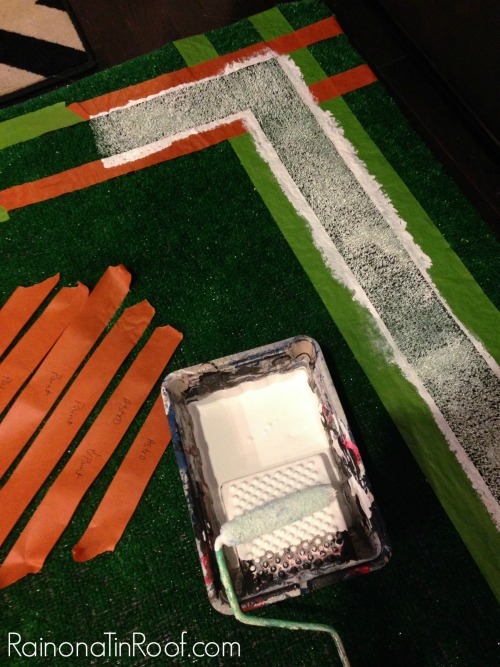 Begin taping off the stripes for the inside of your border. I just chose a spot in the middle of the rug to start a diagonal line with tape and went with it. Once more, I used tape as my measuring guides as you can see above. Continue with your diagonal stripes in the middle of the rug until it is covered. 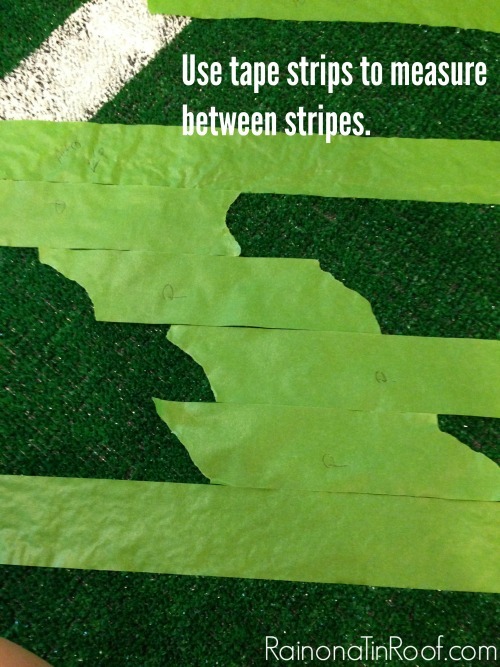 Be sure to run tape along the white edges where your diagonal stripes meet it. 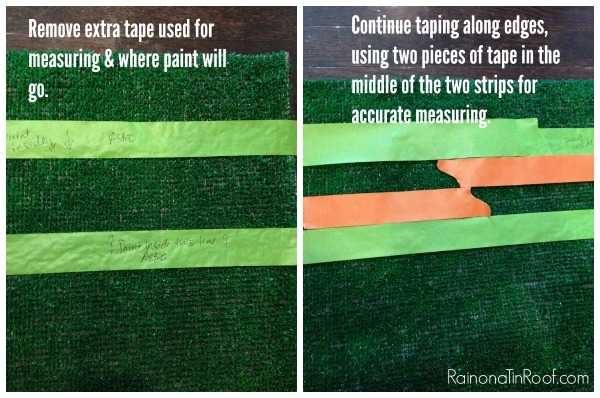 Paint your diagonal stripes using the same method as with the border, then remove the tape. I love how fun this rug is. I put it on the screened-in porch for photos, but am planning on moving it to the front porch when the floor out there is finished. I did somehow mess up my “tape measurements” at one point. You can see where some of my diagonal lines are skinnier than others. No biggie – nothing’s perfect around here. I love the Juicy Passionfruit and stark white against the green. Its a fun, unexpected element. If its not a little tacky, its no fun, right?! 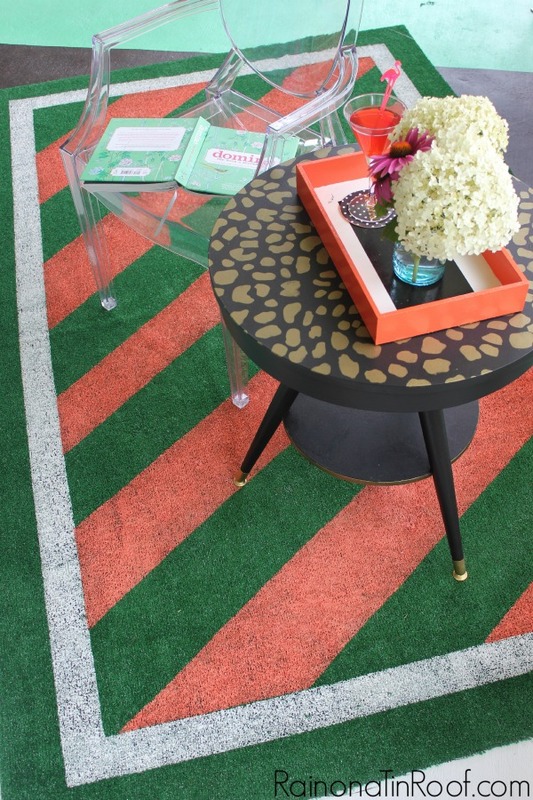 How can you jazz up an AstroTurf rug? Want more great ideas for rugs? 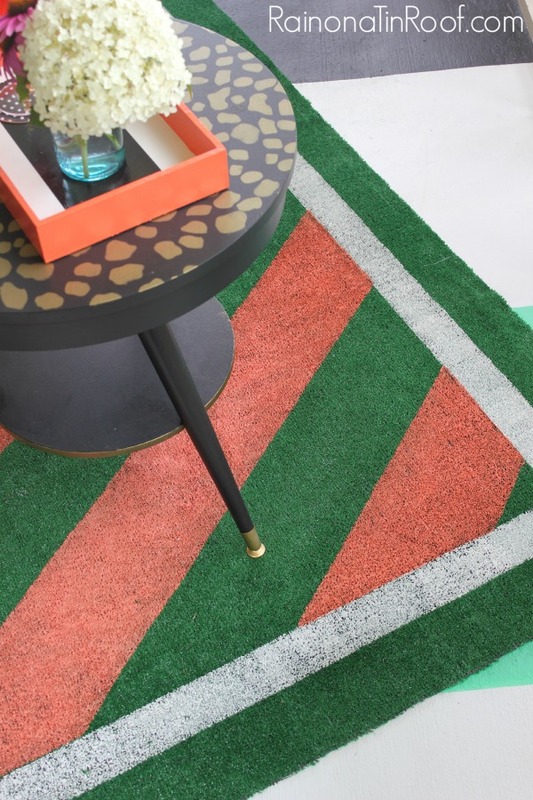 Then don’t miss these 14 painted rug hacks! Love a great cowhide rug? 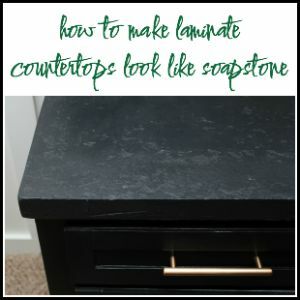 Here’s how I made a faux cowhide rug for about $15. Oh, and here’s my little trick for keeping rugs from sliding on your floors. Love it! Looks really good – and front porch?! What are you doing to it?! I can’t keep up! Thanks! I’m just fixing all the peeled off paint on the front porch! I can’t keep up either -and its my house! I’m with April in my amazement that you can make Astroturf look good! Awesome project! haha!! Thanks, Ashley! I’m just cheap! great idea!love it. i would like to do this to my front porch. but will the rain not ruin the paint, since its acrylic?or is it not acrylic?duh! The paint is latex. Where I had the rug on my porch, there wasn’t really ever any rain that go to it, so that wasn’t an issue. Hope that helps! Thanks, Chris! I don’t think it looks tacky either – so many people do though, which is fine – to each their own! I also like pink flamingos and many people hate them! haha! Honey, With football stadiums across the country now replacing Astroturf with real grass you might be able to get some used turf @ bargain basement prices…Just a thought. Love you. Dad. Thanks for the tip, Dad! This reminds me of my grandma’s back porch 🙂 It’s perfect for an outdoor porch or patio, and if you can paint cool patterns on it? Even better! Emily, that totally makes me smile that it reminds you of your grandma’s back porch! I just love sweet memories of grandparents! This rug is amazing, Jenna! You always come up with such creative projects. 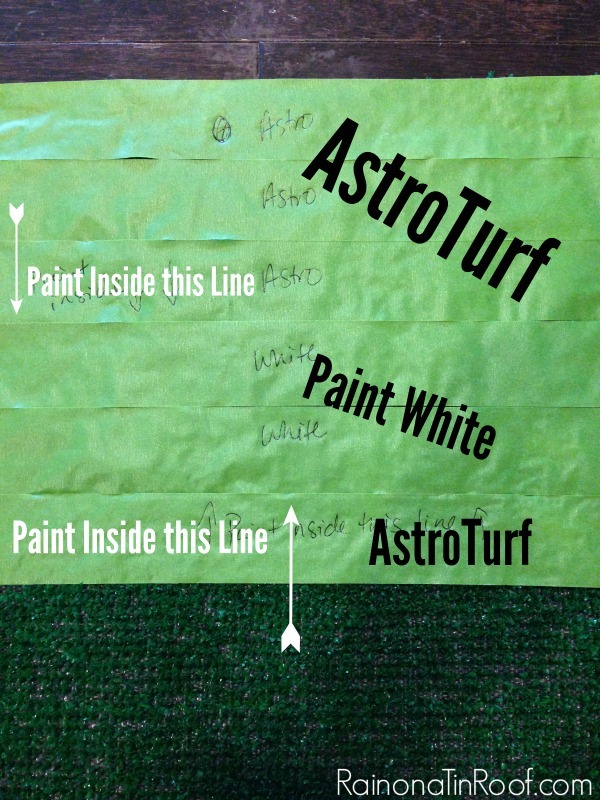 I am actually looking to paint a 10’x20′ section of astroturf like a football field. How durable is the paint? i.e. 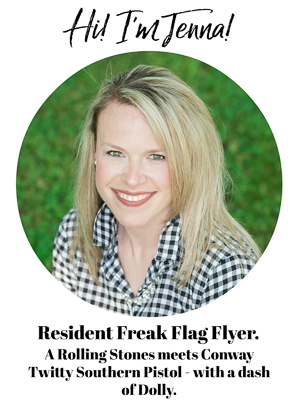 foot traffic, furniture, spills, and kids? This has held up really well, Sean. I might do a few more coats than usual to give it a little extra protection. Looks great! My front porch has astro turf glued on it. what if it rains? 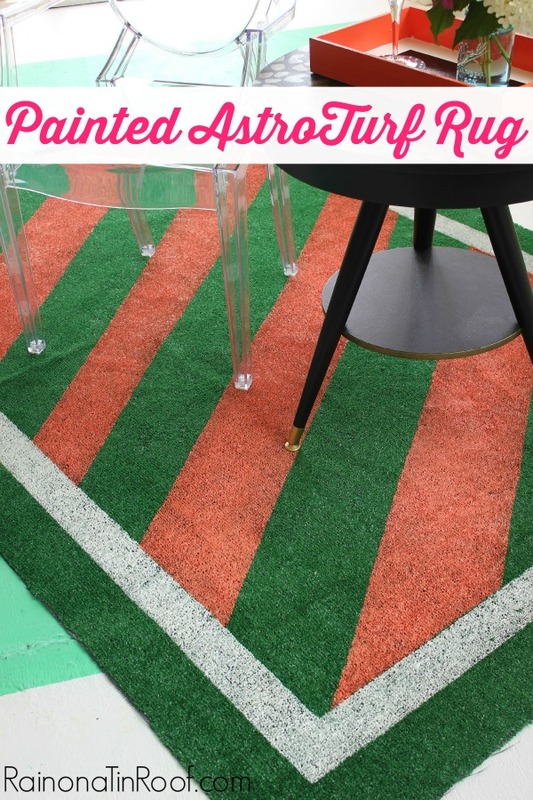 AstroTurf is made to hold up to the elements, so it should be good. As for the paint, use an outdoor paint. And if your porch is covered, it should be even more protected! I am thinking about using your Painted Turf Rug idea for my sons new bedroom. I have redone his entire vintage baseball room without spending much money and the thought of spending $500 on a baseball field rug makes me a bit nauseated. How does the painted turf feel on your feet? I am concerned that it will be stiff and hurt his bare feet. It’s definitely not the most comfortable rug on bare feet. That being said, I have walked on mine bare feet plenty of times. You could go to Home Depot or Lowe’s and get the smallest strip of astroturf you can (they sale it on those huge rolls), paint some and have him test it out. I just love this, it would be great indoors too in a kid’s room. And tacky? Well not used as an area rug, only when trying to actually make it look like grass, and even then over the years I’ve come to realize that even astroturf can be preferable to a brown patch full of weeds, in the neighbor’s yard that is! Thanks for sharing on craft schooling Sunday! It would be fun in a kid’s room for sure! What a fantastic idea Jenna! It doesn’t even look like astroturf anymore! Love it. 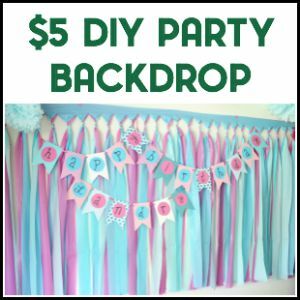 Thanks so much for linking it up to the Inspiration Galore Project Party last week! You are one of my Features this Sunday! Pinned and shared. Have a great weekend! Oh awesome! Thanks so much, Lisa! The rug looks great. I may consider painting our 20×20 ft. patio astroturf in another color. Have you found where you painted over the green with another color that any of it has chipped or flaked so that the green color starts showing through again? Hi William! I don’t have this rug anymore as we moved and no longer had a place for it. However, no I didn’t have any issues with chipping or flaking while I had it. Since it’s been some time now, how has the paint held up? Is it flaking or chipping? Also, I think it looks adorable for your outdoor space. & really, any pattern or image can be painted onto it with the right taping or stencil so that’s how people can make it their own and thats what home crafts are all about. Hi Samantha! I don’t have this rug any longer (there wasn’t a spot for it when we moved houses), but before that, it was still holding up just fine. No flaking or chipping. There was some fading from the sun, but that’s it. Could you use spray paint? Yes. Just be sure to tape off well to prevent overspray getting where you don’t want it.